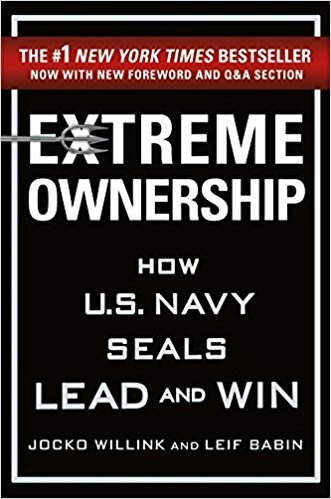 Jocko is also the co-author of Extreme Ownership: How U.S. Navy SEALs Lead and Win — which I loved. Finally, a leadership book that actually demonstrates how to truly lead. Riveting, engaging, and free from the usual cliché platitudes, this book is strikingly impactful and will dramatically improve leaders of all types. Extreme Ownership provides huge value for leaders at all levels. An inspiring and page-turning read, the leadership lessons are easy to digest and implement. It provides a powerful SEAL framework for action to lead teams in high-stakes environments. This book made me a better leader and enabled my entire team step up our game! I recently finished Extreme Ownership. It's written by these two former Navy SEALs. They really talk about what it was like to fight in Fallujah and the different strategies and leadership principles that they had to instill, and really about giving your teammates and your leaders and managers ownership over what they're doing. Oftentimes it will come back and have accountability for whether it was a success or a failure.